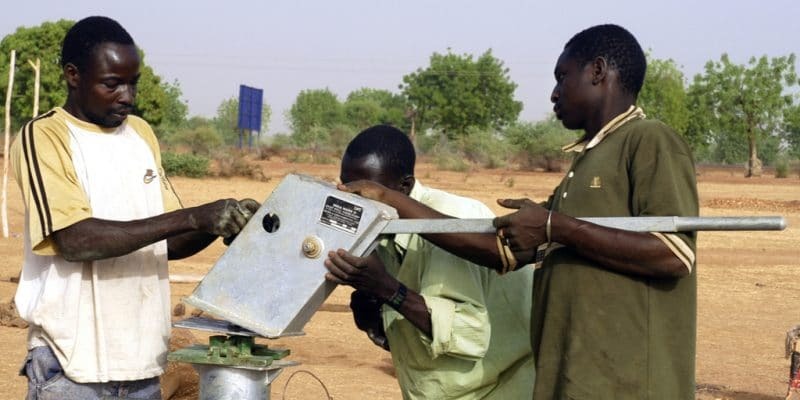 The Ivorian Minister of Hydraulics, Laurent Tchagba, recently announced that the government will launch, in the near future, the project to build 6,000 solar-powered boreholes in rural areas. The project will cover all 31 regions of the country. Laurent Tchagba recently visited Koro, in the Bafing region, west of Ivory Coast. The Ivorian Minister of Hydraulics was there for the inauguration of a new water supply system. At the end of the ceremony, which was attended by many residents, Laurent Tchagba announced that the government is preparing to launch a vast project to provide drinking water in rural areas. In concrete terms, it involves the construction of 6,000 solar-powered boreholes. The project will cover all 31 regions of Ivory Coast. In several villages in this West African country, human-powered pumps are already in operation. They will be replaced by motor pumps running on clean energy. The Minister of Hydraulics believes that the project will first relieve the burden on women who traditionally have the responsibility of bringing water home. “All they need to do is push a button to get water,” he says. The project is part of a much larger programme, launched by the government, called the “Water for All Programme”, which aims to provide drinking water to 95% of Ivorians by 2020. The programme is one of the priorities of President Alassane Ouattara, who is currently serving his last term as head of Ivory Coast. To set it up, the government created a fund of 200 billion CFA francs, more than 304 million euros. The money will be used to build urban and rural infrastructure. Accompanying measures are also planned, for example, the reduction of connection tariffs and more flexibility for the payment of invoices. The frequency of payment of the water bill will be reduced from 3 to 2 months, without any financial impact on the consumers’ bill. The objective is to “allow low-income households to easily pay their water bills”. Since the beginning of 2018, the cost of social connections has also been reduced. The price of the meter benefits from a price reduction from 224 euros to less than 2 euros. This government subsidy will provide 450,000 households with access to safe drinking water. A similar programme has been set up in the energy sector. It is called the “Electricity for All Programme” (Pept). The Minister of Petroleum, Energy and Renewable Energy, Thierry Tanoh, estimates that by the end of 2018, 500,000 people will have benefited from it.